Although the San Francisco Bay Area has coverage from the operational NEXRAD radar network, a combination of complex topography and marine environment provides unique forecasting challenges. 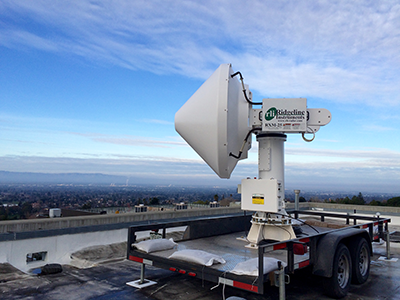 As part of NOAA’s El Niño Rapid Response Field Campaign efforts to help improve understanding of heavy rainfall processes in the Bay Area, an X-band radar system was deployed in Santa Clara to augment operational monitoring with research-quality, high-resolution measurements of precipitation from February through May 2016. The system provided high quality precipitation estimates for use by the National Weather Service to forecast extreme flooding and by the Santa Clara’s hydrologic modeling system to predict localized urban runoff. In a new study to be published in the Journal of the Meteorological Society of Japan, researchers from the ESRL Physical Sciences Division and Colorado State University analyzed rainfall from several events that occurred in March 2016 in the Santa Clara – San Jose region. They found that rainfall estimates from the X-band radar were in good agreement with rain gauge measurements over accumulation periods ranging from minutes to hours. Hourly rainfall accumulations from the X-band were shown to perform better than similar estimates from NEXRAD. The X-band radar provided high quality rainfall estimates that performed better than NEXRAD, demonstrating the added value of the X-band system. In the San Francisco Bay area, a network of X-band radars, together with advanced precipitation forecasting techniques, has been shown to produce benefits to cost ratio of 5 to 1. High resolution rainfall monitoring systems in urban regions can provide a host of benefits across different sectors of the economy, including flood damage mitigation, water quality, water supply, and transportation—and help keep communities safer. Authors of High Resolution Radar Quantitative Precipitation Estimation in the San Francisco Bay Area: Rainfall Monitoring for the Urban Environment are: Rob Cifelli (NOAA), Haonan Chen (CIRA) and Lynn Johnson (CIRES) of ESRL's Physical Sciences Division, and V. Chandrasekar of Colorado State University.